Getting to transfer fuel from one tank to another safely is an important aspect of all people that use fuel regularly. A fuel transfer pump is an important machine to help you transfer fuel from one tank to another with ease. Ever tried pouring gasoline directly from a can into a car? You probably know how dangerous and messy things can get. Having fuel transfer pumps will keep things topped up easily and safely. Fuel transfer pumps can top up motorcycles, lawnmowers and even your car with ease. They are the perfect machines for transferring fuel from one tank to another safely. Some of the best pumps have flexible intake hoses, strainers to keep particles out, great suction power and many more. This article aims at making your selection process simple by highlighting only the best based on quality, functionality, and price. Read on and get yourself a high-quality fuel pump today. FuelWorks is a very nice pump with a fast flow rate to fill your tank within a short period. 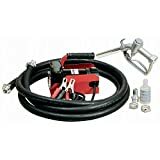 This is a heavy duty pump that comes with all the parts required for a faster and easy installation. It is a stable pump that works well and gets the job done in the shortest time possible. It delivers up to 15 GPM/57 LPM with a 12V motor. The nozzle comes with a lockable holder and an extension suction tube. FuelWorks is a great pick with thermal protection and a filter screen inlet. 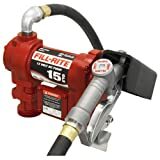 The Fill-Rite is another powerful fuel pump with a 20 GMP flow capacity at 2,600 rpm giving users a maximum lift of 37 inches. The pump is well-built with iron cast housing, a bunan mechanical seal an O-ring for durability. The pump is suitable for the transfer of diesel, gasoline, kerosene, B20, E-15 and mineral spirits. The Fill-Rite has a 15 GMP flow capacity at 2,600 rpm and a maximum lift of 37 inches. Like most Fill-Rite pumps, this one is housed in an iron cast for durability. It has a buna-n mechanical seal and O-ring for durability. It is a great option with ¼ hp, 12VDC and 20 amp DC motor for powering the fuel. The pump is UL and CUL listed for explosion proof. There are two threaded bases for tank mounting and stability. The FuelWorks pump is another durable choice made from steel that lasts for decades. It is a small size pump that is portable, reliable and easy to install. 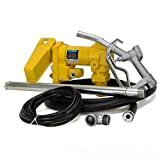 The pump is specifically designed for use with diesel fuel making it a great choice for boats, pick-ups, agricultural operations and many more. It comes with a 13 ft of fuel hose pipe and a manual dispensing nozzle. The fuel hose can easily be cut into two to serve as inlets and outlets for your fuel. The hose for the pickup rolls and it’s hard to reach the fuel in the drum when not full. The Fill-Rite SD is a perfect fuel pump for pumping diesel fuel, gas and kerosene with an amp draw that is easy to your DC power. Just like other Fill-Rite, this one is a sturdy machine made in the USA with the highest standard possible. It is explosion-proof listed UL/cUl. It comes complete with a 10ft static wire hose and manual nozzle making your pumping experience enjoyable. This is another efficient fuel pump that includes a battery cable and clips. It has an 8-inch ¾ inch hose, a pickup strainer, and a ¾-inch nozzle. The pump ensures that only clean, pure fuel gets through the strainer. It is a versatile pump that is compatible with antifreeze and diesel. It has a 10 GMP flow rate and works perfectly making it a great value for your money. The SD602G Fill-Rite has 13 GMP flow rate capacity at1, 725 rpm with a buna-n mechanical seal and O-ring for durability. It has a maximum lift of 8 inches, ¼ hp, 115V and 1.5 amp motor. The pump works effectively for transferring gasoline, diesel, kerosene, mineral spirits, E-15 and B-20. The FR Rotary pump works efficiently delivering up to 10 gallons of fuel per 100 revolutions. It us UL approved and can be used to pump most fuel safely. It can also be used to pump in a reverse direction making it versatile. It has a cast iron rotor and can be locked using a padlock. The iron cast ensures the pump remains lightweight and resists corrosion. The FR1210GA Fuel pump makes great fit transferring kerosene, diesel, E-15, biodiesel and any more. It is a versatile pump that will offer you a great value for your money. It is heavily constructed using the cast iron that resists rust while ensuring the pump is lightweight. It comes with a 2-inch threaded base for mounting. The amp draw is easy on your DC. The pump is explosion-proof listed for UL and CUL. The XtremepowerUS is our number one fuel pump and rightfully do with amazing features that one would love to see in a fuel pump. The pump has an amazing 20 GMP flow rate with RMP speeds of 2,600. It has a maximum suction lift of up 8 ft ensuring you get to draw your fuel to the lowest levels with ease. The pump works like a charm getting the job done fast and efficient. It is a lot faster than most pumps out there, and the price matches well-giving users good value for their money.